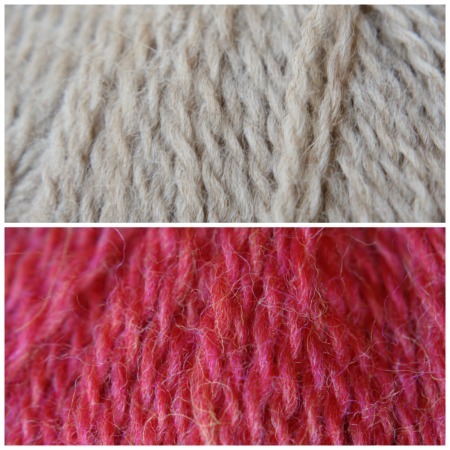 When it comes to colors, heather yarns are often lumped in with solid yarns. At first glance, heathers do look like solids. Its only on close inspection that a person can tell they are not a solid color at all, but a blend of two or more colors. I guess its my abnormal need for precision and accuracy, aka geekiness, that compels me to point out the difference. Or maybe its because I’m currently working with two heather colors, Raspberry Heather and Coriander Heather in Palette. I broke out my close up lens for these pictures. As you can see (I hope) the Coriander is mostly tan with a small amount of darker brown. The Raspberry is a pinky-red with some yellow. That’s heather yarn for you. Its a blend of different colored fibers and it gives the yarn a dynamic, textured look. The thing about heathered yarns is that you have to start with fibers of different colors. With solid colors, semi-solids, and variegated the dyeing can, and usually does, happen after the yarn has been spun. 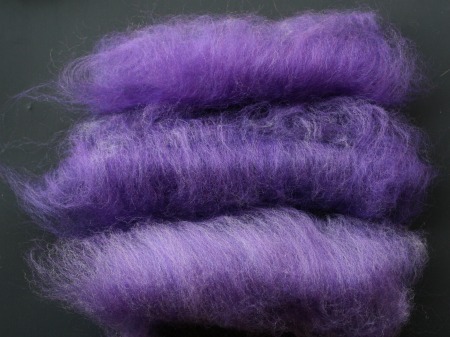 But with heathers, the fiber has to be dyed first, then blended with another color, and then spun. If you’ve ever dyed loose fiber then you know that can be tricky business. Its easy to end up accidentally felting the fiber together into a big colorful blob of wool. If you can successfully get over that hurdle, there is the blending together of colors. Even when that is done commercially, its an extra step. All of this is to say it takes more work to make a heather yarn. I remember when some companies separated heather colors from solids and charged a bit more for them. That custom seems to have largely faded away perhaps because, as one yarn sales rep told me, heathers outsell solid colors by a 2 to 1 ratio. I suspect those tricky yarn companies simply inflated the solids to the heater price and patted themselves on the back for their cleverness. So you probably have plenty of heather yarn in your stash. You probably picked them over solid colors because they have deeper, richer, more authentic looking color. I actively look for heathers when I buy yarn. Its not that I never buy solid colors. I certainly do. But when given a choice between a solid blue and a heathered blue, I buy the heathered. Heathered colors give the illusion of texture. Therefore, they are better at hiding imperfections. That applies to imperfections in your stitch work as well as imperfections in your body. A heathered fabric will smooth over a bit of bulging and that is always a good thing. Because of all this, and other justifications that will come to me shortly, I wasted an entire afternoon engaged in a heathering experiment instead of working on any of the four shawls I currently have going. The two colors I picked to heather up were purple and white. I used a pair of hand carded to blend them. I could have used a drum carder (expect I don’t have one) or a blending board (Don’t have one of those either) but I contended myself with my small hand carders (and don’t encourage me to go shopping because I’m not sure I have any room for any more yarn making stuff). Then I got to work making rolags. 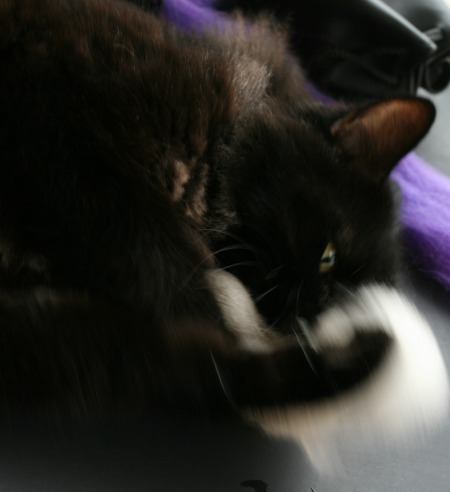 Then I rescued my fiber from The Evil Cat Monster. Then I got to work making rolags. And spun them up. And the yarn into a swatch. And then I rescued my swatch from The Evil Cat Monster. You can see (I hope) how increasing the amount of white fiber, increasing the heathering, takes away from stitch definition. The more heathering you have, the more mottled the fabric looks and the more uniform it all looks. Sometimes that is exactly what you want in a yarn. Thanks for sticking with me as I indulged in my inner yarn geek. 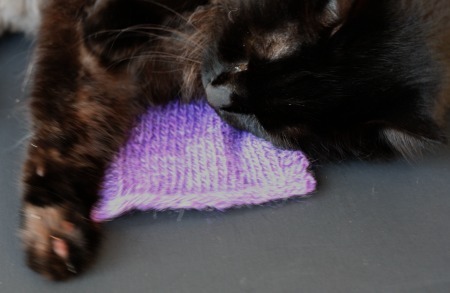 And, for the record, as soon as I put the camera way and started writing this post, the Evil Cat Monster lost all interest in the purple-n-white heater yarn. Its been sitting unmolested on the coffee table for hours. Now that I’m done with it, she has lost all interest in ripping it to shreds. 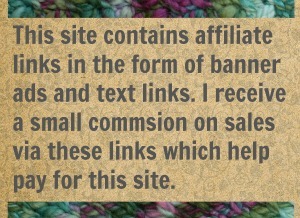 16 Comments on "How Heathered Yarns Are Made"
Thanks! I agree, of course. Just love the look of heathered yarn. And I believe after 6 months I may be back! And what a change 6 months makes! I looovvveee that purple! If the cat doesn’t want it I’ll take it. Thanks for this heathered post. That Purple yarn is quite nice and now I know what to do with a difficult project that I may need to hide some imperfections in. Absolutely! Heathered yarn is great for anytime you just want a swath of color. Excellent pint. 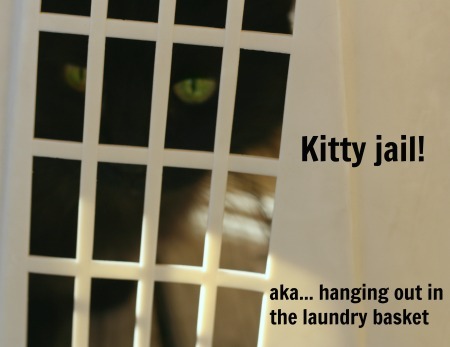 As a soinner and knitter with two cats shedding non-stop I have to hide quite a bit of cat hair. 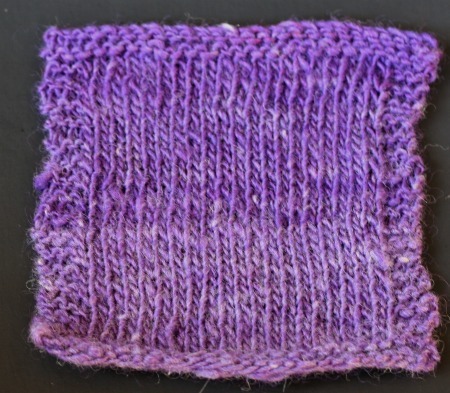 Love the purple and enjoyed the info on heather yarns. Thanks! And who doesn’t love purple?